The Amphitheater of El Jem is an immense theatre in the classic Roman town of Thysdrus (now El Jem), dating from the 3rd century. The elliptical theatre had room for 60.000 spectators. The amphitheatre of El Jem was made a WHS because of the accomplishment of its construction and as a symptom of Roman imperial propaganda. I have literally just returned from a trip to Tunisia and visited El Djem, Carthage, Dougga and Thubouro Maius - stunning! This was very special, thinking about walking where Romans have walked before. All of these are sites not to miss. A tip for tourists; don't do the organised trip, hire a car and driver and you will see much more and at a pace to suit yourselves and at a price equivalent to the organised trip. visited el djem and the roman amphitheatre...wow!For lovers of roman art and history this place is a must..do not make the same mistake as us though...do not go on an organised trip/excursion...you will be rushed and not have enough time to take in the atmosphere of this magnificent site.Sit in the stands and just imagine the death and destruction that went on in there in order to satisfy the masses...walk up the entrance to the arena,from the dungeons below and you are walking in the footsteps and seeing the sights of gladiators from thousands of years before you...El djem puts you back in time...you can hear the crowds roar...aswell as the lions! Just come back from a visit to El Jem and was awestruck at its beauty and size! There is really nothing left to the imagination- you can picture the gladiators, slaves and lions clashing in the oval shaped auditorium. The best section of the colosseum, in my opinion, is the dungeons. They are almost perfectly preserved and it is possible to walk through the lion enclosures and along the corridors into the auditorium. 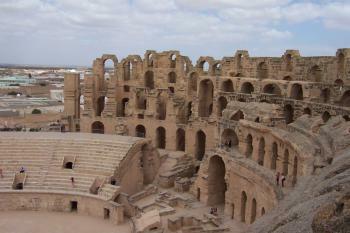 This site is a must for all visitors to Tunisia, particularly fans of Roman history! magnificent place to see was blown away!!! The ampitheater of El Jem was great, but we ended up stranded in the town (which is not so great) because our coach driver neglected to tell us that another bus wouldn't stop unless...well, unless he felt like it. Anyways, the ampitheater was amazing. You can explore it to your hearts content, unlike the one in Rome. The most impressive part was going down underneath where many pisoners would have spent their last few lonely moments. Having arrived in el jem by train and being the only tourists in town at that time i was rather apprehensive and then made more so by being refused a cup of coffee in a cafe full of tunisian men .But all my reservations were forgotten upon first sight of the coloseum ,what a magnificent example of roman architecture and to see it on the edge of the desert even more amazing.ElJem itself is a fascinating place,real Tunisia if you get away from the tourists you,ll still find the camels head outside the butchers shop and the cages of rabbits waiting to be picked for someones dinner ,but thats what we go to see how different cultures are ,a brilliant place can,t wait to go back. El-Jem is a small town in the middle of the desert. 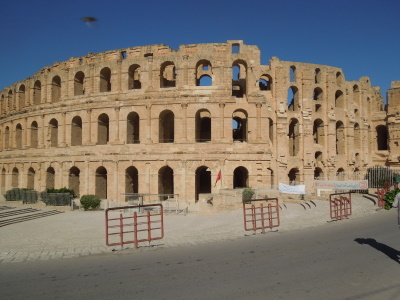 We passed there by train from Sousse, and were impressed by the sight of the colosseum sprouting out of nowhere! The Colosseum is superb! It is indeed much better preserved than that of Rome. And the museum nearby having Roman mosaics and statues is also well kept. A must-see site! We then got back to Sousse by using the Luage system - cheap and well organised. Now a small town in the middle of nowhere (well, at the edge of the desert), El Jem, the ancient Roman town of Thysdrus, was formerly a crossroads of the caravan trade and a very wealthy town, as you can see in its amazing coliseum, which is probably the finest anywhere - including the one in Rome. You can really see how the Roman Empire had an influence even on remote parts of the Empire, and how the locals wanted to outdo Rome. The place is not far from the touristy coast, so a trip from there is not complicated and no doubt worth the effort. The Coliseum at El Jem is pretty fantastic and it has a capacity that was probably greater than the population of the town that now surrounds it! The site is really impressive as it is the largest Roman building in Africa and was the third largest Coliseum in the Roman World! The south side is the one through which you enter and is the area that is most intact. The size of the structure is impressive especially when seen from the centre "stage" and there is a fair bit of the ruins open for you to clamber over. The site makes a nice day trip from Sousse or a great lunch stop if travelling from the south (Sfax or the Sahara! ), and if you have luggage with you every restaurant owner in town will offer to store it for you in the hope that you will get lunch at his restaurant after looking around. What a magnificent coliseum! A true testament to the engineering skills of the ancient Romans. A few hours drive from Tunis this impressive site could easily be visited as a day trip from Tunis or the resorts around Hammamet. I took a louage (the ubiquitous shared taxis) via Sousse, which cost less than 10 dinars. Pardoning the camel rides and curio stands outside, this site is worth a visit for anyone interested in Roman building and fans of the Gladiator film. Unfinished constructions: the amphitheatre was never completed due to political rivalries and lack of funding.